Aimee Fujishin is from Rosemead, California, and has lived on Okinawa one year. 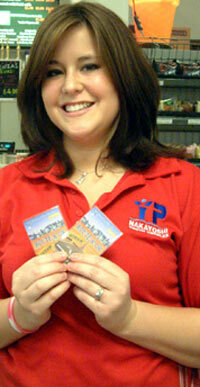 In this week’s raffle she won two dinner tickets to restaurant Sam’s-by-the Sea. She says that for her “Okinawa is different.” On her free time she likes to hang out with family and friends, and also go to shopping. Sarah Bos has also lived on Okinawa for a year. She says that her time on the island has been great as she has met a lot of great people here. She likes to go to the beach, and spend time with her husband. Her favorite hobby is photography. She won $40 worth of telephone tickets courtesy of KDDI’s Route K-OK.